A patch of martian soil analyzed by NASA’s rover Spirit is so rich in silica that it may provide some of the strongest evidence yet that ancient Mars was much wetter than it is now. The processes that could have produced such a concentrated deposit of silica require the presence of water. Members of the rover science team heard from a colleague during a recent teleconference that the alpha particle X-ray spectrometer, a chemical analyzer at the end of Spirit’s arm, had measured a composition of about 90% pure silica for this soil. Spirit’s miniature thermal emission spectrometer observed the patch, and Steve Ruff of Arizona State University noticed that its spectrum showed a high silica content. The team has laid out plans for further study of the soil patch and surrounding deposits. “This is some of the best evidence Spirit has found for water at Gusev,” said Albert Yen, a geochemist at NASA’s Jet Propulsion Laboratory. One possible origin for the silica could have been interaction of soil with acid vapors produced by volcanic activity in the presence of water. Another could have been from water in a hot spring environment. The latest discovery adds compelling new evidence for ancient conditions that might have been favorable for life, according to members of the rover science team. Spirit and its twin rover, Opportunity, completed their original three-month prime missions in April 2004. Both are still operating, although showing signs of age. One of Spirit’s six wheels no longer rotates, so it leaves a deep track as it drags through soil. That churning has exposed several patches of bright soil, leading to some of Spirit’s biggest discoveries at Gusev, including this recent discovery. The newly discovered patch of soil has been given the informal name “Gertrude Weise,” after a player in the All-American Girls Professional Baseball League, according to Ray Arvidson of Washington University in St. Louis, deputy principal investigator for the rovers. “We’ve looked at dozens of disturbed soil targets in the rover tracks, and this is the first one that shows a high silica signature,” said Ruff, who last month proposed using Spirit’s miniature thermal emission spectrometer to observe this soil. That instrument provides mineral composition information about targets viewed from a distance. 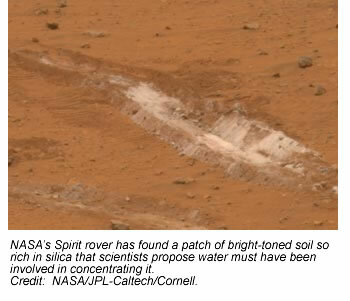 The indications it found for silica in the overturned soil prompted a decision this month to drive Spirit close enough to touch the soil with the alpha particle X-ray spectrometer. Silica commonly occurs on Earth as the crystalline mineral quartz and is the main ingredient in window glass. The martian silica at the Gertrude Weise patch is noncrystalline, with no detectable quartz. Meanwhile, on the other side of the planet, Opportunity has been exploring Victoria Crater for about eight months. “Opportunity has completed the initial survey of the crater’s rim and is now headed back to the area called Duck Bay, which may provide a safe path down into the crater,” said John Callas, project manager for the rovers at JPL. JPL, a division of the California Institute of Technology, manages the Mars Exploration Rover project for NASA’s Science Mission Directorate.